With the heavy rains that characterised most of the opening day of track action at Losail stopping before the end of the first timed Superbike session, Winston Ten Kate Honda rider Karl Muggeridge had to work hard to try and get into contention. With wet weather settings in place at the start of the one-hour timed session, but a drying line appearing slowly, the riders had no opportunity to adjust their machines to match the new conditions. Muggas is aware that today's results may count for little, with the advent of better weather expected in the final qualifying and Superpole sessions on Friday. Muggeridge opted not to take part in the morning session, held in fully wet conditions, but on the drying track in the afternoon Muggeridge was 13th fastest. An indication of the prevalent track conditions comes from the fact that fastest rider Troy Bayliss was still some 16 seconds from the previous track best. "Today did not work out the way we wanted. The boys went out in timed qualifying but did not feel too comfortable on the bikes. We adjusted their bikes to make softer settings and then a dry line started to appear, so the adjustments proved to be the wrong way. Towards the end they could not improve their lap times, as the bikes were set-up for a wet track. Tomorrow will be dry and we will be moving up quite a bit then." "Not the best start but the good thing is we tried something we had never tried before in the wet. In the beginning it was not too bad, but in the end, when the track dried out, the feeling was terrible. By that stage, we had no time left to change. So we crossed paths, but we know how to improve in the dry tomorrow. I am not too bothered about today, the bike is running well and we are looking to tomorrow. No drama." A day of mixed fortunes for the Winston Ten Kate Honda Superbike rider Karl Muggeridge falling in his Superpole lap after qualifying second fastest in regulation. Until his misfortune in Superpole Karl Muggeridge had been a candidate for rider of the day, scoring second in regulation qualifying, and dipping under the two-minute lap barrier on race tyres in the final free practice session, which took place just before the Superpole contest itself. Muggeridge was to fall entering a complex of right hand corners carrying a little too much corner speed, running out of road on the first corner exit as he tried to score his first career Superpole win. In the first sector of the Superpole lap Karl was almost half of second ahead. 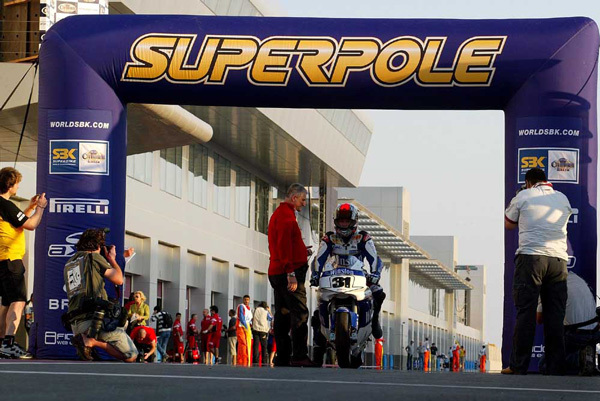 "We were looking in good shape for Superpole. We all could see how Karl's lap was; unfortunately he didn't take it to the finish. We can also all see that Karl has already made a big step from last year to this year. The majority of people know what our ambitions are for 2006 now, which are clearly to run with the front guys." 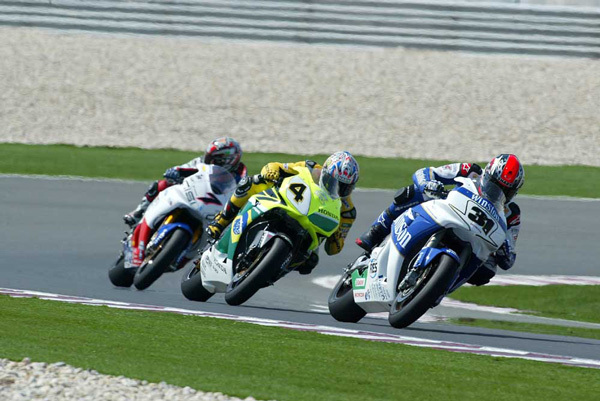 "It cools down in the afternoon here and during Superpole it had become quite cool. We opted to put a slightly harder front tyre in but that was decided a couple of hours before. My last thought when I left the garage was, 'should have gone for a softer one.' I pushed and pushed but I was a little hot into the corner. It was the first of a group of three rights, and it's fourth gear there, so it was a pretty fast crash. I tried to save it but I ran out of track. It could have been worse because my fast lap in regular qualifying was second fastest of all and that means I only drop down to start form the second row." After some outstanding performances in qualifying, Karl Muggeridge (Winston ten Kate Honda) could only take a 12th and ninth place finishes, after his number one machine did not respond as expected in race conditions. Residual damage from a crash in Superpole was deemed the likely cause, and Muggeridge now sits overall ninth in the championship. "That was a bit of misfortune for Karl, who showed good pace earlier in the weekend. He got into trouble with his number one bike. There has been some damage after he crashed on yesterday, but something we cannot see. For Phillip Island we will change the chassis and everything else to make sure everything is OK. If he did not have that difficulty I'm sure he would have had a couple of good top five finishes." "It was no good really. I struggled from beginning to end. Something is wrong with the bike and we daren't change to the second, as we hadn't run that other one yet. So to say I am disappointed is an understatement. Every time I entered a corner, right or left, it was chattering, and I was so sideways. It has to be the bike, because James and I have such a similar race set-up, it's just not funny. "